This year I decided to spend the long holiday weekend in Europe. Ok, that was a slight exaggeration. I actually spent a day in the darling little European town of Poulsbo, WA, but you can’t blame a girl for dreaming. Located on Liberty Bay, Poulsbo is a picturesque Scandinavian storybook village complete with Viking murals, antique stores, gift shops, and the Sons of Norway lodge and the world-famous Poulsbo Bakery. Poulsbo also has two great pubs for the weary shopper to grab a bite and a pint. 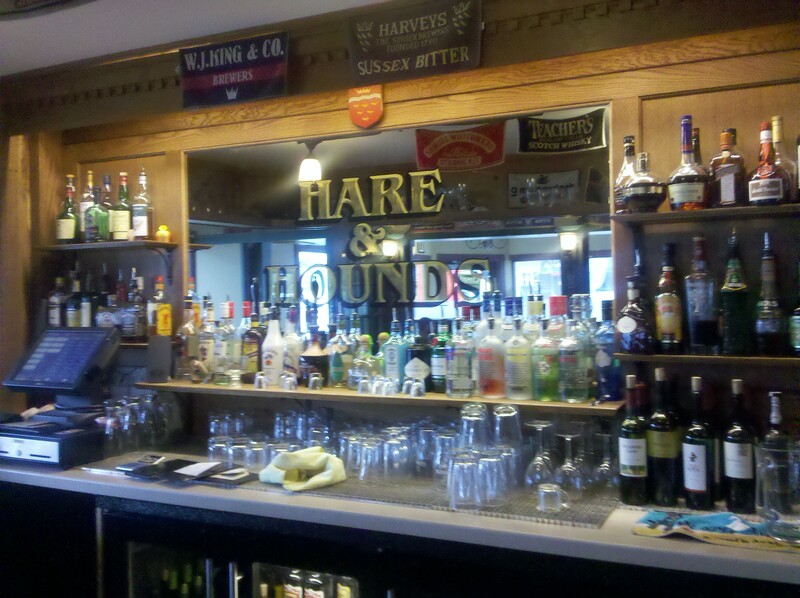 My first stop was the Hare and Hounds English Pub on Front St. Decorated rather sparsely, the pub is a bit brighter than I’m used to seeing in an English pub. The walls are painted in very light tones and the tables and chairs are basic. The restaurant resembled a sidewalk café more than a British pub. The bar area is adorned with British beer cans and bottles and soccer towels hang from the walls and ceiling. Though the pub did not give me the “rustic” British pub feeling I love, it is a pretty establishment nonetheless. The menu consists of the English pub standards like fish and chips, shepherd’s pie, and ploughman’s lunch. But, the chicken and rice soup was unbelievably great. The beer tap selection was a pleasant mix of different beer styles. 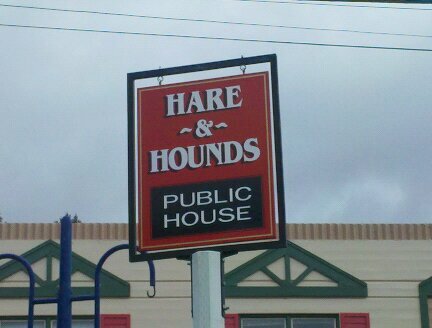 Again, Hare and Hounds carry some British pub standards like Guinness, Harp, and Newcastle, but microbrews from the Pacific Northwest dominate and are constantly rotated. As for their bottled beer selection, I was quite impressed. Large bottles of Samuel Smith’s and Samuel Smith’s Raspberry is available along with bottles of Young’s Double Chocolate Stout and other British favorites. Our bartender, Dan, was extremely friendly and very beer savvy. He was a delight to talk to while enjoying my lunch and a pint…or two. My next stop was just a small walk up the street to Tizley’s Europub. If you want a cool “rustic” vibe you will surely find it at Tizley’s. 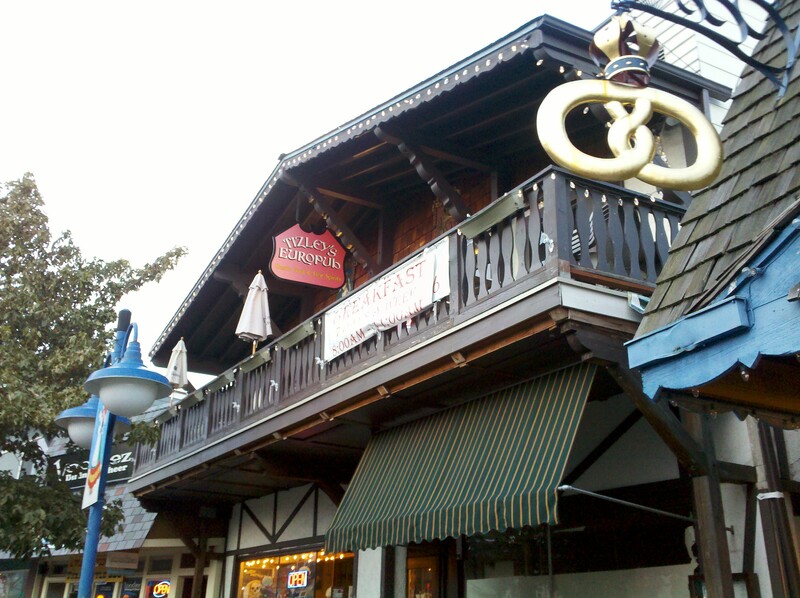 Located on the 2nd floor of one of Poulsbo’s many adorable Bavarian style shops, Tizley’s charm begins on your walk down a small alley to the staircase that leads you upstairs into the middle of the pub. There is a very casual, old world feel throughout and there is outside balcony seating for lunch, dinner, or the relaxing afternoon pint. Tizley’s serves just about every type of Bavarian Schnitzel possible along with other European favorites such as Sausage and Peppers, Black Forest Ham sandwich, Beef Boxty and of course, the traditional Goulash. But my favorite reason for coming to Tizley’s is their wide selection of European and microbrew beers. Like Hare and Hounds, Tizley’s also rotates their beer selection so you always have a fresh pint of whatever is in season. But the true beer treat of the day was the Cherry Rye from Poulsbo’s newest brewery, Valhöll. Poured by way of a hand pump, Cherry Rye was a strong yet smooth beer with just a hint of dark cherries. Delicious! Valhöll Brewery is still under construction but will be opening soon on Front St. just doors down from both pubs. In the meantime you can enjoy their beer at both Hare and Hounds English Pub and Tizley’s Europub. And trust me, as soon as Valhöll opens I will let you all know! Winter is a great time of year to visit Poulsbo…and during Oktoberfest…and Viking Fest. Pretty much anytime of year is a great time to visit Poulsbo and its great pubs!